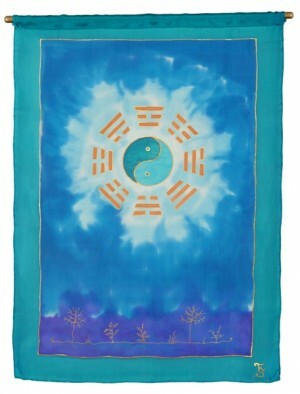 (1) INDIVIDUALISED MANDALAS: I offer a special service of creating your own individual mandala on silk. This personalised mandala painting serves as a strong focal point in your home or workspace, depending on where you choose to hang it. The mandala is implemented in many forms of therapy to enable the client to find an easy way of expressing inner conflicts which are deeply buried and cannot find expression in words, thus overcoming huge barriers within a short time. Mandalas are also excellent focal points for meditation which enhances peace of mind and eases problem-solving with whole-minded brain activity. Meditation is also an ideal way to calm the mind, reduce stress levels, bring clarity into your every-day life and to further inspire you to greater creativity. Your personal mandala is a reflection of your soul with colour vibrations tailored to uplift and inspire you at all times, harmonising and balancing at all times. When you commission me to paint your own unique mandala on silk, we discuss the basic colours to be incorporated, ones you particularly resonate with, and then I create your mandala in flow with your energy. Please allow around 30 days for completion of a standard mandala (approx. 40m x 40cm). Large mandalas (approx. 90cm x 90cm are very work intensive and can take up to 2 months for completion. Your completed artwork is carefully packaged, rolled up in a secure postal tube for safe transport. I am there to give you advice on how to back, mount and frame your mandala. To see an animated video of my mandala work, please follow this link: Mandala video. 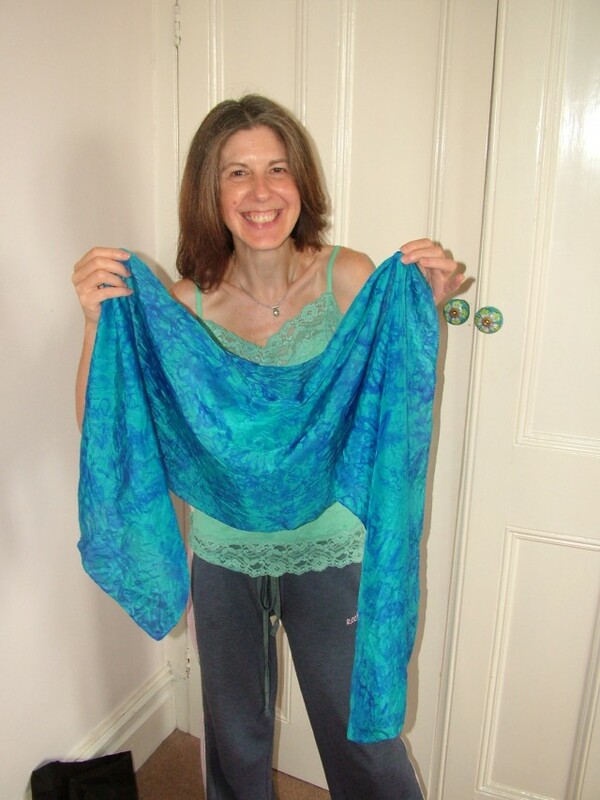 (2) INDIVIDUALISED SILK SCARF: Would you like me to create a beautiful, vibrant and original scarf for you in the colour and design of your choice? This can be on pongee, crepe-de-chine or chiffon, depending on the look you want. You original and individualised silk can be created in any number of layers and combination of dyes, using different types of resist and techniques. No two scarves ever turn out exactly the same and so your piece of artwork is completely unique to you. You can also choose whether or not you’d like a long thin scarf or one that is square as each one creates its own individual look and style. I can give you suggestions as to how to tie your silk artwork for the optimum look. 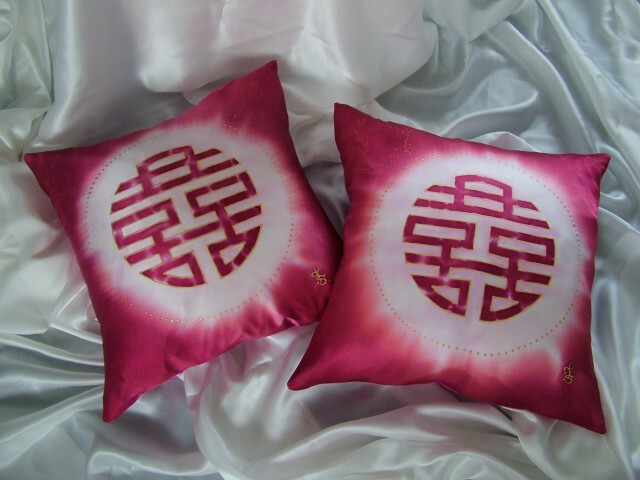 (3) PERSONALISED CUSHION COVERS: You can either have a single unique silk art cushion cover painted according to your specifications or a matching pair or set of 4. There will be slight price discounts for sets of 2 or 4. I typically paint cushion covers using satin silk to give you a beautiful sheen. You can choose the colour scheme and design as well as colour of dupioni silk for the back panel. Designs can be painted in a variety of different techniques using wax, gold resist, salt and tie-dye. This photo shows a gold resist pattern on satin silk with a double happiness motif. (4) UNIQUE WALLHANGINGS: You can choose to have a wall hanging or banner in practically any size you want. I typically paint these on pongee which wafts in the breeze and is then hung from a slim baton with a silk cord. These are perfect for any living space and can be adapted to match your colour scheme and ambience. The designs can be created using a variety of techniques, so please chat to me about the different possibilities available. You can also have a full length of silk created as a drape to hang as a focal point in a room. Satin silk would be a good choice for this type of wall hanging. Another good look might be to have a small hanging on either side of your bed. If you work as a holistic therapist or are involved in the healing arts, you might like to have an individualised piece created for your place of work. The vibrant colours on silk can have such an uplifting and therapeutic effect on those who come into contact with them. (5) INDIVIDUALISED HANDPAINTED SILK FABRIC: I also create individual lengths of silk which you can use to make a beautiful item of exotic clothing for yourself. Please ask for a quote, letting me know what sort of piece you have in mind and we can discuss the silk type, design and colour scheme. You can choose to have something very simple but with vibrant or pastell colours which hold the stage all by themselves, or something with lots of fine detail. Prices will completely depend on the complexity of the design and therefore the time involved. (6) MANDALA SILK PANELS FOR PERSONAL PROJECTS: You can have printed, hand embellished satin silk mandala panels created for any project you can think of. I normally order these, embellish them with gold resist and then stretch them onto chunky frames to create beautiful, easy to hang silk pictures. However, you can order these panels alone and incorporate them into your own creative projects. 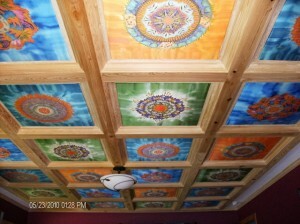 Here is an example of one magnificent coffered ceiling one customer created. 24 panels were delivered to her home and these were then individually inserted into the custom made ceiling she had designed. I find the result truly awesome. (7) ACRYLIC PAINTINGS: I also paint pieces of artwork on chunky frames using acrylics. I love to apply the paint to the canvas using a palette knife and getting really physical, enjoying the textures and layers that emerge. These pieces of artwork tend to completely take on a life of their own and I just follow my intuition, allowing my hand to be guided and relaxing into the process. I am creating a short video showcasing some of my acrylic abstracts and will be sharing it here with you very soon now. If you would like me to create an individual piece of artwork for you, please contact me personally either by e-mail at info@silkandart.com or by phone at +44 (0)7873348933 to discuss all further details. I look forward to hearing from you. Such beautiful work Fiona. As an artist myself, very inspiring to see you ‘go for it’. Also, a deeper understanding of the value of mandalas helps tremendously my telling to others the value of your work. Thank You. Hi Fiona, is this mail sufficient to take part in the Friday-art drawdle-a-doodling-lee? Aside that, I ‘d wish to comment on the wallhanging with the BaGua you present on this page… Did you know it is called “Later Heaven Bagua”? It represents our Manifested World, where lots of things aren’t (by design or intent) imperfect, so as to generate change and evolution. This imperfection is shown by the opposing trigrams not balancing out in yin and yang. But there is also the “Earlier (Former) Heaven BaGua”, in which the juxtaposed trigrams always are in complete yin-yang balance, and this represents the World before Creation, the word of Utter Harmony. It is used by the Chinese as a wall-decoration to bring harmony and peace into the space where it hangs. One caveat: most bagua-mirrors that are sold in chinese shops, are wrongly composed and don’t have this effect! While in the Later Heaven BG the trigrams are indeed to be read from the outside inwards, it is opposite in the Former Heaven BG: there the trigrams to be placed correctly for reading from the centre towards the outside. where I write “lots of things aren’t imperfect”, I wanted ofcourse to write “perfect” (silly me) !